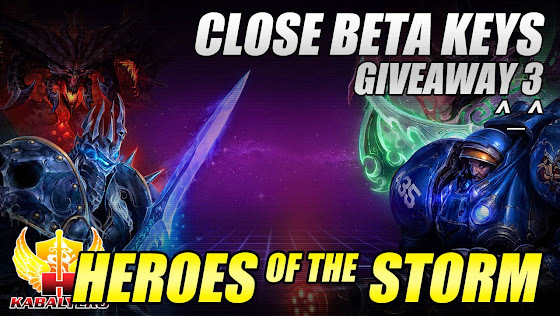 Heroes Of The Storm Close Beta Keys Giveaway 3 (Close) - KABALYERO - PLAY, BLOG & EARN! Heroes Of The Storm Close Beta Keys Giveaway 3 will, hopefully, give you a chance to get a Close Beta Key to Blizzard's awesome multiplayer online battle arena game, Heroes Of The Storm. I've already given away 20 Heroes Of The Storm Close Beta Keys to 20 lucky people in the previous giveaways. If you didn't win in those previous giveaways then here is another chance for you because I'm giving away 10 more Heroes Of The Storm Close Beta Keys. Just login with your name and e-mail in the Giveaway Tools Widget below and submit your entries. Please use a valid or real (not fake) e-mail address because I will send the Close Beta Keys to the winners through e-mail. This particular Heroes Of The Storm Close Beta Keys Giveaway will start and end on (please refer to the Giveaway Tools Widget for the dates). Update: The Giveaway is over and the Winners have been generated by Giveaway Tools. I've listed them below and have sent them their Close Beta Keys via e-mail. P.S. This Heroes Of The Storm Close Beta Keys Giveaway is for Philippine gamers only. The reason for the restriction is because the keys were from the SEA Publisher of the game. Thank you for understanding. Login into your Battle.net account as requested. Or you can create new one, if you don't have. Once you are in Code Redemption page, enter code in the available field and press Redeem Code.